Like a slap in the face, the sculptures of Dutch artist Folkert de Jong have an overwhelming immediacy of materiality and historically referenced imagery that is emotionally powerful and strangely sublime. 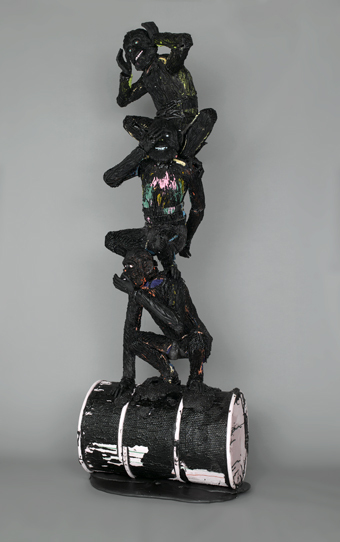 Part jester, part moralist, de Jong has attracted international attention for his savagely dark figurative sculptures that combine references to art, world history, current events, and popular culture. The Museum presents two major sculptures and recent drawings that are best understood against the backdrop of the wars in Iraq and Afghanistan and the worldwide economic crisis. Unsettlingly raw and lacking decorum, his Styrofoam and polyurethane foam works challenge our assumptions of high art and comfort with the conventions of human depiction in gruesome tableaus like Operation Harmony. Amsterdam-based de Jong has exhibited internationally since the early 2000s and has been the recipient of a number of awards including the prestigious Prix de Rome for sculpture in 2003, and the Den Haag Sculptuur ‘Orange Award,’ 2005. His work was most recently featured in a major solo exhibition organized by the Groninger Museum, the Netherlands. Curated by Bruce Guenther, chief curator and The Robert and Mercedes Eichholz Curator of Modern and Contemporary Art. Sponsored in part by the Miller Meigs Endowment for the Contemporary Arts and the Paul G. Allen Family Foundation.